Bo Xilai, Disgraced Chinese Official, Is Indicted : The Two-Way Once a rising star among China's political elite, Bo's career crashed in 2012 after his wife was connected to a British businessman's murder. That led to accusations of corruption and taking bribes. 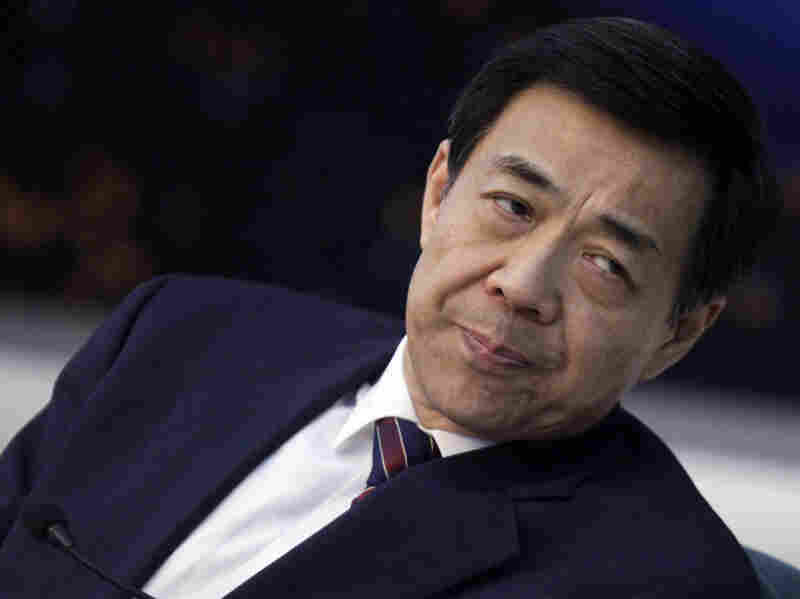 Bo Xilai, a rising star among China's political elite until his career collapsed in early 2012 after his wife was connected to the murder of a British businessman, was charged Thursday "with taking bribes, embezzlement and abuse of power," China's Xinhua News writes. On Morning Edition, NPR's Anthony Kuhn said the indictment isn't about things Bo allegedly did while in his most recent position as the Communist Party boss in Chongqing, which as The New York Times notes is "a municipality of 30 million in southwest China." Before his fall: Bo Xilai in 2010. Instead, Anthony reports, the charges are that "two jobs ago," as mayor of Dalian, Bo took $3.3 million in bribes and embezzled an additional $1 million or so. The case "certainly doesn't deal with any of the big issues of his last job." Authorities may wish to have a case that's "tightly scripted around the corruption charges" and does not touch on the "political infighting" that might have contributed to Bo's downfall, Anthony says. It isn't known yet when Bo will be put on trial, Anthony adds. It's unlikely he would be given a death sentence if convicted. A more likely penalty, says Anthony, would be a prison sentence of 15 to 20 years — or possibly life. -- From A 'Death' To A Crisis, Tracing China's Bo Xilai Scandal. -- Once Prominent Politician Bo Xilai Expelled From China's Communist Party. -- Wife Of Ex-Chinese Official Given Suspended Death Sentence.